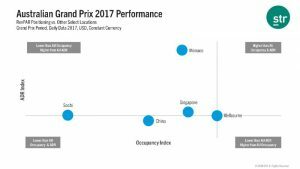 After posting a 42.2% premium in average daily rate (ADR) during the Formula 1 2017 Australian Grand Prix, hotels in Melbourne are again expected to see a strong performance uplift around this year’s event, according to STR. While this marked a substantial rate premium for Melbourne, STR analysts noted that several select markets saw more substantial occupancy and ADR uplifts while hosting the event last year. Melbourne, however, typically operates at higher occupancy and ADR levels, so the performance increases during the Grand Prix are particularly noteworthy. Recently in February 2018, Melbourne hotels recorded a 1.6% increase in occupancy to an actual level of 88.7% and a 0.8% increase in ADR to AUD189.17. As a result, RevPAR grew 2.5% to AUD167.72. STR analysts note that increased domestic travel has helped boost the market’s hotel performance, as household income and spending are both up, according to the Australian Bureau of Statistics.